Jakobikirche is one of the most visited churches in Chemnitz and together with the Old Town Hall and the New Town Hall form one of the most visited architectural wonder of this little German town. Jakobikirche is an open city church that offers its visitors many services. Located right next to the Benedictine monastery, The Jakobikirche is one of the most important buildings of the pre-industrial era of Chemnitz. Built between 1350 and 1412, this high-Gothic hall church is one of the most photographed places in Chemnitz. The church sustained many damages during the war but was later restored and today, stands tall in its full glory. People normally club together Center Sachsenallee and Galerie Roter Turm while planning their visit to Jakobikirche. Beeindruckendes Bauwerk einer evangelischen Kirche, die am Ende des Zweiten Weltkriegs ziemlich zerstört war. Ein Modell in der Kirche macht das erschreckend anschaulich. 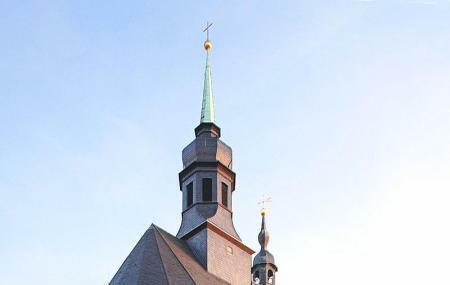 Die Kirche im gotischen Stil entstand um 14. und 15. Jahrhundert und sie hat Ähnlichkeiten mit der Sebalduskirche in Nürnberg. In der Kirche finden regelmäßig Ausstellungen statt. Aktuell ist es eine Bilderschau und Mitte November folgt die alljährliche Krippenausstellung. Kirchen gehören geschlossen und zu Diskotheken oder Wohnhäuser umgebaut.